For fans of the TV series, Murder, She Wrote, this latest entry in the written series by the same name has everything they will need to travel back in time and revisit Cabot Cove. Authors Donald Bain, Jon Land, and yes, even Jessica Fletcher, have cornered the market on cyberspace and hackers. The story opens at a Cabot Cove Labor Day party given by Babs and Hal Wirth, Jessica’s good friends. The party is an annual event at their estate and the town is invited. But tragedy hits when Babs discovers Hal’s body in their kitchen. Enter Seth Hazlitt, crusty old doctor, whose preliminary diagnosis is massive heart attack. Hal is rushed to the hospital where he dies, and Seth’s diagnosis is held up as the cause. But Jessica doesn’t see it that way. She’s sees evil surrounding his death and sets out to determine if Hal was, indeed, murdered. Within a short time of Hal’s death, Babs learns that he apparently squandered their entire fortune . . . millions of dollars . . . within days of his death, and no one knows where the money went. In a short time, a man introducing himself as Lawrence Pyke, Hal’s lawyer appears, warning Jessica to not search through Hal’s background. Jessica pays no attention to him, and within a day, she discovers he is not who he said he was. He was Hal’s ex-partner and he is murdered! In the meantime, Babs’ daughter, Alyssa, returns from college with her boyfriend, Chad, as Jessica continues to delve into the circumstances of Hal’s death. Although Sheriff Mort Metzger is not convinced this is anything more than a tragic but normal death, he agrees to listen to Jessica. Jessica recalls that Eve Simpson, local real estate agent and town gossip, conducted video interviews of the guests at the party. Jessica asks to see the videos and in one she discovers a shadowy figure of a man exiting the Wirth’s kitchen just at the time that Hal had suffered his attack. Now Mort is more interested. When Babs asks Jessica to go through some of Hal’s papers, hoping to find evidence of the lost money, Jessica instead discovers a manuscript of Hal’s memoir, and in it he confesses to having joined a dating site, LOVEISYOURS, when he and Babs were having some marital problems. Remembering Chad, Alyssa’s boyfriend, Jessica quickly takes advantage of his computer skills, particularly his hacking skills, and she asks him to look into the dating service that Hal used. To her disappointment, Jessica learns that any information on Hal Wirth and the site either did not exist or has been wiped clean. Mort and Jessica pay a visit to the home office of the dating site and meet Sean Booker, the owner. He can’t explain what may have happened to the data, or that Hal was even a client. Jessica is convinced that the dating service is part of the plot to do in wealthy clients and steal their money. She puts herself in danger when she has Chad build a phony profile for her and sign her up with a dating service. Within one day, she finds herself with three dates . . . any one of which could be involved with the plot to steal her made-up character’s millions. As Jessica wanders through the maze of clues set forth, she finds herself being stalked. Is she getting too close to the truth? She is almost killed when hit by a car, then she is stalked while doing research in the library, and in a thrilling moment at the conclusion, she is chased through a construction site and nearly killed. Now, Bain, Land, and yes, even Fletcher, cleverly block every path that Jessica uncovers. They toss in some red herrings just for fun, and the reader has to pick and choose which are real clues and which are not. But Jessica keeps following even the smallest of crumbs, certain that they will lead to the truth and recovery of the lost millions. The reader may think s/he has determined whom the perp is, but should not be surprised if things change as the story comes to a successful conclusion. Reading this story is just like reliving the TV series in one’s mind. The favorite characters appear—Eve Simpson, Harry McGraw, Doc Hazlitt—as we knew them 30 years ago, and again today in the reruns. The one disappointing aspect of revisiting these characters is the way Bain and Land have painted Eve Simpson. In the TV series, she is Jessica’s good friend, whereas in the book she is described as mean-spirited and gossipy, not someone who Jessica would befriend. Land and Bain should have watched some of the episodes involving Eve and perhaps they would have drawn her in a different light. There is a lot of time spent on character and event backstory that any fan of the TV show would already be deeply familiar with, and could perhaps have been eliminated. Having said that, the book is a fast read; the story arc is clear and moves logically from one point to the next. 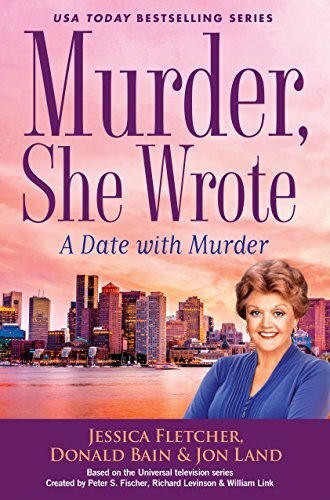 As a fan of Jessica Fletcher, reconnecting with her was a hoot—an enjoyable hoot.